"A custard-like dessert flavored with orange liqueur." In a medium bowl, beat eggs and yolks. Beat in sugar until smooth. Set aside. In a large saucepan over medium heat, combine cream, half-and-half, the vanilla bean and its scrapings, and the peel of one orange. Heat until bubbles form at edges of liquid, reduce heat to low and simmer 15 minutes. Beat hot cream into egg mixture, a little at a time, until all is incorporated. Stir in orange liqueur. Pour into 6 individual ramekins or custard cups. Bake in preheated oven 45 to 60 minutes, until set. Let cool completely before serving. 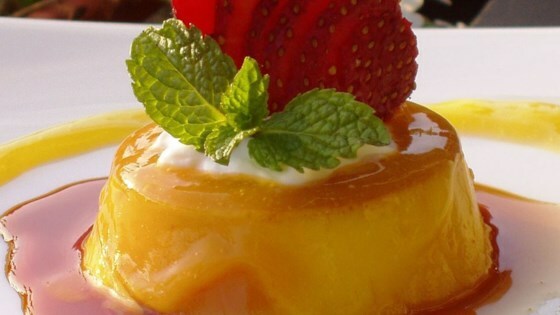 See how to put a tropical twist on traditional flan.